Rhianan walked down the dirt road, picking wildflowers and putting them in her basket. A bonnet, tied around her long, golden hair, kept the bright, summer sun out of her eyes. A black and white cow was standing in the field, grazing on the shimmering green grass. MOO! "How lovely. It’s a cow." Rhianan sat on the wooden fence and watched it. MOO! It ripped the grass up with its mouth and chewed slowly. Rhianan laughed when she saw a yellow butterfly fluttering around the cow’s ears. They wiggled back and forth and up and down, trying to shoo the butterfly away. MOO! The cow’s tail swooshed back and forth and sometimes even landed on its back for a few moments before it fell back down. Rhianan loved watching the cows. "I’ve got to go now, cow, but I’ll be back again soon," she said. 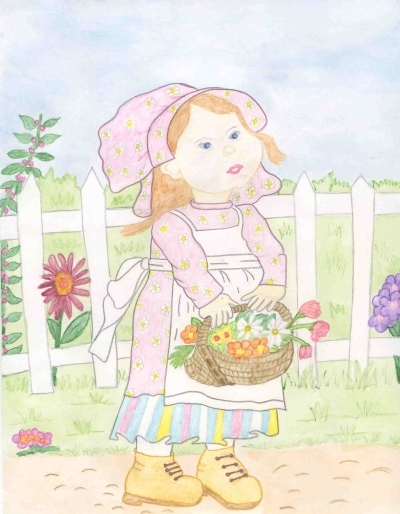 She climbed down from the fence, picked another handful of wildflowers, put them in her basket and walked down the road. She soon passed two tall oak trees. Their leaves were olive green and very large. "I wonder if there are any acorns growing?" Curious, she put her basket down at the side of the road and walked closer to the trees. "Brilliant. There are millions of them," she smiled. The branches were covered with acorns, green and round. Some had fallen to the ground and were scattered about among the grass. Rhianan saw a squirrel in the tree. It was standing on a thin branch, holding an acorn in its front paws. "Hello, bonny squirrel. What are you nibbling on? An acorn?" she asked it. Of course, the squirrel ignored her. It was nibbling away, not paying any attention to her. She didn’t want to disturb him so she picked up her basket of flowers and continued down the road. "I’ll come and see you again," she called, waving her hand goodbye. She spotted hundreds of sheep standing in a field. There were so many of them that she could hardly see the grass. BAA! BAA! BAA! "You’re very noisy sheep!" she called, not being able to hear her own voice. She had to cover her ears with her hands, carefully, as not to spill the flowers she’d been gathering. Several of the sheep came running to the fence as she walked past. BAA! BAA! BAA! They stuck their noses through the wooden fence. Rhianan laughed at them. "Do you want me to pet you?" She put her basket down and walked to the fence. Even though it was noisy, she petted their soft wool and pink ears. "Stop making so much noise and I’ll pet you more." As she petted them, she noticed that some sheep had white wool. Others had light brown, dark brown and some even had black wool. The sheep licked her hand. "You’re licking my hand and it tickles," she giggled. A dog came running out of nowhere and started barking. BARK! BARK! BARK! The sheep scattered and ran in all directions, trying to get away from the dog. "It’s a sheep dog. I hope he doesn’t hurt the sheep," she said, worried. Rhianan watched for a few minutes, saw that the dog was only trying to herd them and so, feeling better about it, picked up her basket of flowers and headed down the road. Two bluebirds flew across the path, swirling and swooping as they chased each other through the trees and bushes. "What pretty birds! I love bluebirds." When Rhianan got home, she showed her mum all the flowers she had gathered in her basket. "Look, Mum. I got some daisies, some carnations, some bluebells, heather and even a thistle." "They’re lovely, Rhianan," her mum replied. "Why don’t you fill a vase with water and put the flowers in it?" Rhianan carried the filled vase over, being careful not to spill the water. She put the vase down in the middle of the kitchen table. "I had a nice walk today, Mum. I saw a cow and a bonny wee squirrel. The cow was eating grass and a pretty butterfly flew all around its ears. I think it was tickling the cow," she chuckled. "The squirrel was eating acorns from the oak tree. Its cheeks were fat and it had gray fur." "Did you see anything else," her mum asked. "Oh, yes, Mum. I saw lots of sheep. I petted a few of them. They let me. I like the ones with white wool the best." "Oh? Were there sheep with other colors of wool?" her mum asked. Rhianan thought for a few moments and then blurted out, "Yes, Mum. There were sheep with black wool and some with brown wool and I saw two bluebirds. They were having a race. They were pretty. I like bluebirds, Mum." "It sounds like you had a lovely walk, Rhianan and we’ve got these beautiful flowers to remind us of all the things you saw today." She hugged her daughter and then they sat at the table, looked at the pretty wildflowers and talked. It was a wonderful day for Rhianan.